Before the Chesapeake and Ohio Canal, river boats sixty to seventy-five feet in length regularly plied the Potomac River and its tributaries, carrying 100 barrels and more of flour, or other cargos. As we now look at the upper Potomac River, the part above tidewater, and see only the occasional bass boat, kayak and canoe, we may find it hard to realize that this was once a river of commerce. Most published works discussing the Potomac Company (1785–1828) and earlier navigational schemes for the upper Potomac focus on their business and political aspects. Dan Guzy's research instead emphasizes the history of navigation itself, that is, the history of routes, structures, boats, and cargos on the upper Potomac and its tributaries. 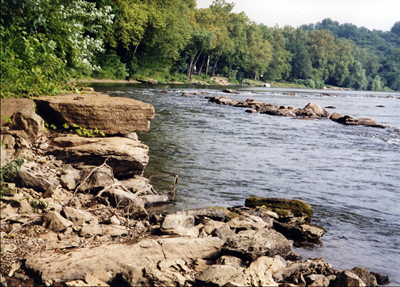 This is the second edition of his book, Navigation on the Upper Potomac and Its Tributaries, the first edition published by the Chesapeake and Ohio Canal Association in 2008. This edition adds additional information and color photographs of navigational features along the Potomac River. See: Navigation on the Upper Potomac and Its Tributaries. Please note that for easy navigation of the document, all endnote numbers are hyperlinked to the note itself. Western Maryland Regional Library is most grateful to Dan Guzy for allowing us to publish this second edition of his book.